Last week, we got our best look yet at the all-new Mercedes GLS thanks to new spy photos sent to us showing a camouflaged prototype. But just before its world debut at the 2019 New York Auto Show this week, leaked photos posted by Almuraba show the new BMW X7 rival in all its glory. While the BMW X7 has received a lot of praise, the full-size luxury SUV will soon face some stiff competition from the more established GLS. 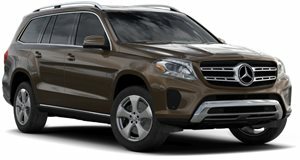 As expected, the new second-generation 2020 Mercedes GLS looks like a larger version of the GLE compact SUV, adopting the company’s new design language. Copious amounts of chrome applied to the exterior give the seven-seater SUV a premium look and the slim LED headlights and taillights have clearly been lifted from the smaller GLE. Inside the luxurious cabin, the similarities with the GLE continue, as the flagship GLS has a very similar dashboard design. Elsewhere, we can see dual 12.3-inch displays linked to the latest MBUX infotainment system and a three-spoke steering wheel. According to Mercedes, the new GLS will benefit from a 60-mm longer wheelbase and feature three fully electrically adjustable seat rows. Like the new GLE, the next-generation GLS will feature E-Active Body Control ensuring "superior suspension comfort, agile handling and good off-road capabilities." It will also be equipped with the latest generation of Mercedes-Benz driving assistance systems. The new GLS will share the same MHA platform as the GLE, so it should be significantly lighter and more technologically advanced than the current model. A wide choice of powertrains will be available, including the latest 48-volt mild-hybrid units and the straight-six engines found in the GLE. More powerful AMG versions will also feature the company’s familiar twin-turbo 4.0-liter V8. All models will send power through a nine-speed automatic transmission. The 2020 Mercedes GLS will make its official debut at the New York Auto Show on April 17, but it could be revealed online sooner now that these images have leaked.